Nanorobots living in our bloodstream, communicating with each other to, among other things, identify health concerns and automatically take corrective action. 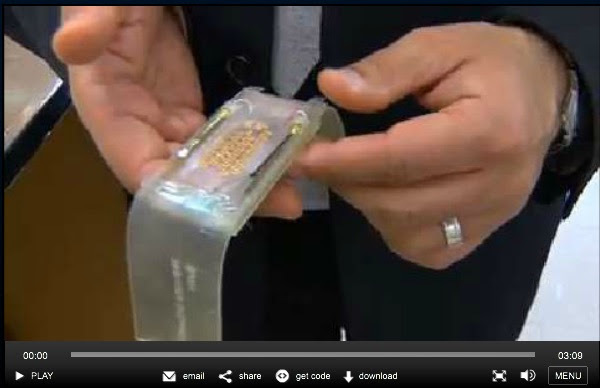 Brain implants that allow for perfect eyesight and hearing and limitless memory. Growing functional organs in a dish. Hospitals serving primarily as centers of rejuvenation and preventative care, rather than illness treatment and recovery. These are just a few of the healthcare predictions that medical futurist Dr. Bertalan Meskó lays out in his book The Guide to the Future of Medicine: Technology and the Human Touch. Granted, Meskó believes those trends only to be in the most nascent of stages, unlikely to manifest meaningfully for years. But he also writes of trends that have already begun to dramatically reshape medicine. Meskó expects scores of us soon to be walking around with tiny, wearable body sensors that collect data to help us make better, quantifiable health decisions. (In the February 2015 issue of TLV about the Consumer Electronics Show, we included a link about a French company making smart clothing for athletes – just one example of how these sensors might be incorporated seamlessly into our daily lives.) 3D printing is poised to radically change the transplant industry, allowing for transplants of body parts, like ear cartilage and jawbones, once thought inconceivable. As Meskó points out, the most significant developments on the horizon are the multitude of possibilities unleashed by the convergence of big data and genomic sequencing. When the first human genome was sequenced in 2003, it was after 13 years of effort and $3 billion in investment. At the conclusion of the project, it cost $1 billion to sequence an individual’s genome. Today, that cost is around $1,000, down from $20,000 about five years ago, and the whole thing can be wrapped up in a matter of days. The idea behind building a massive database of sequenced DNA is so researchers can pinpoint genetic mutations consistent across a medical condition, and then create drugs that target the very genes that drive that issue. Of course, none of this would be possible if not for the rapid growth in computer storage and processing speed we’ve seen in recent years. One genome is 100 gigabytes of data, which is about how much space it would take to store 102,400 photos. As more health research companies seek volunteers for data sequencing, computer storage and processing speed are going to take on an ever more critical role. Each genome contains about 3 billion data points. To manage, sort and analyze this unthinkable amount of data, multiple healthcare data management companies are cropping up to support the shift to personalized, or precision, healthcare. According to Dr. Eric Green, director of the National Human Genome Research Institute, how we administer illness treatment will look “crude and rough” compared to what we’ll be capable of in 10 to 20 years. "So much of medicine is just based on the average patient," he said in an interview with Smithsonian Magazine. The goal of precision medicine is to be able to look at an individual’s DNA and then determine the exact right treatment for that person, rather than trying what works on the average patient. 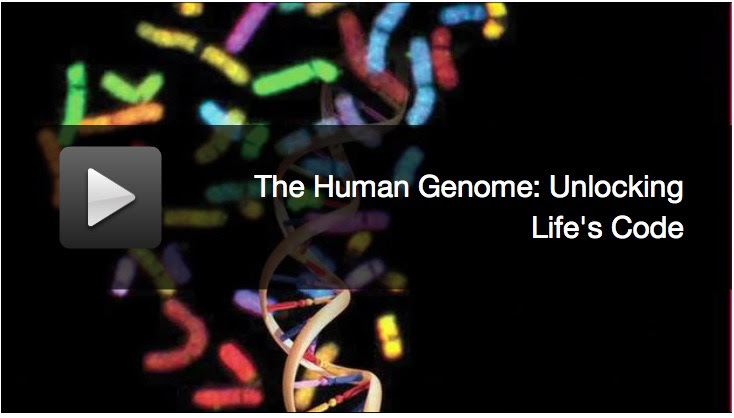 We understand the human genome more than ever and technology has finally made it affordable. The shift to electronic health records is providing huge quantities of data. New devices, like wearable, smart technology, are allowing instantaneous and longitudinal data tracking. We have the technology to store and process extraordinary amounts of data. And, importantly, the volunteers are there to sequence more and more DNA. Genomic sequencing is just one slice of the medical revolution pie. In this TED Talk, doctor, scientist and innovator Daniel Kraft provides a comprehensive, high-level overview of the numerous ways technology is transforming medicine. In the dedicated links section below, we’ll delve deeper into some of the most fascinating, mind boggling and exciting technologies that could make for a quantum healthcare leap in the not so distant future. What will all this innovation mean? How will it impact our economy? What are the privacy implications of our DNA in open and federal databases? Might healthcare one day make us all bionic? Will we one day be able to “cure” death, as Google is trying to do? Federal Reserve Board Chairman Janet Yellen recently suggested that economic “headwinds” from the crisis have not fully abated, a key reason that the pace of normalization of the Fed funds rate is likely to be gradual. Yellen is basically suggesting that after seven years, our economy has still not yet reached a more “normalized” state. Exactly what this normalized state may be is something even the Fed may find tricky to define. How will we know when “normal” has been reached? Or is our economy still in the throws of trying to find a “new normal”? What are our true economic growth engines? In the 1990s, our growth engine was the explosion of technology – first the fax machine, then PC, cell phone and Internet. Everyone had to buy new stuff that ended up changing the way we work, play and live. In the 2000s, the growth engine was the lowering of interest rates in response to the 2001/2002 recession, combined with regulatory stimulus that led lenders to provide mortgages to people who couldn’t afford them. Since the 2008/2009 recession, our economy seems to have been driven by government fiscal and monetary stimulus – historic, multi-year federal budget deficits and massive Federal Reserve monetary stimulus. If we take a step back for a view of the economic forest, it seems we haven’t had a “normal” economy – one that is working without massive government intervention – since the technology era of the 1990s. That’s almost twenty years ago, twenty years where “normal” has meant dependence on government instead of the private sector. If the Federal Reserve is looking for a “normalized” economy, maybe it should try to influence our political leadership in Washington to enact policy that unleashes the private sector economy rather than continues to burden it with ever increasing government control. Or maybe we just have to wait until the next new private sector catalyst shows up to carry our economy forward. When that happens is anyone’s guess. The same seems to hold true for looking for a return to whatever people like Fed Chairman Yellen consider “normal. Even though our unemployment rate has plummeted since the last recession, we have yet to see a meaningful expansion in consumer spending. This is problematic since consumer spending supposedly makes up about 70% of our economy. The elephant in the room is the makeup of job growth since the last recession. A whole lot of that job growth has come at the low end of wages. Lower level service, retail and restaurant jobs have been the big winners since we climbed out of the economic ditch. These are not jobs that support significant consumption, that support a return to a normalized economy. This weakness in job growth, which translates into weakness in consumption, may be one of the biggest reasons Fed Chairman Yellen has yet to grow enough confidence in economy to allow interest rates to rise. Any month now we will likely start to see weakening employment numbers. Surely the significant reduction in capital investment in the domestic oil and gas industry is resulting not just in primary oil and gas job loses, but is also trickling down to many other employment sectors. As a banker friend suggested, “Even the orthodontist in Houston is in the oilfield services business.” Time will tell how a significant reduction in US private sector investment will affect our overall job market. You can figure anything out. All it takes is a little time and lots of desire. All of us tend to believe we can do anything we put our minds to, but not so many of us make the mental and emotional commitment required to achieve our loftiest goals. It’s always great to be reminded of how far intense desire can take us. For example, we may consider last year’s American League batting champion, a diminutive second baseman for the Houston Astros. Listed at 5’6” on the roster seems a bit of a stretch when you see him next to the “normal” baseball player. How did Jose Altuve get to the major leagues, and then become batting champion? More than any other factor, it surely was his desire. 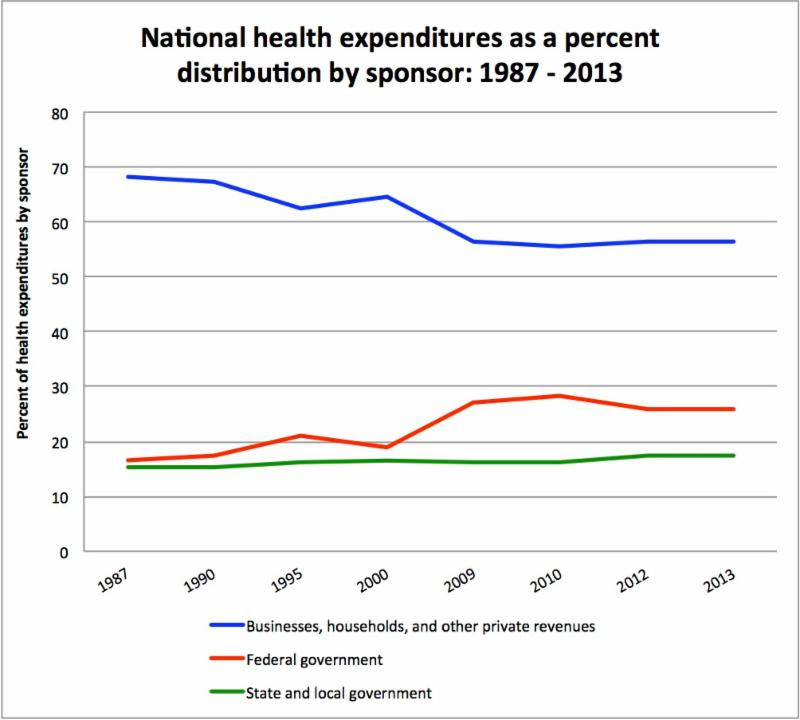 The following chart shows how the share of national health and medical expenditures from private households, businesses and other private institutions has stacked up against the share from state governments and the federal government for about the past three decades. As of 2013, governments paid for 43.3% of all medical expenditures, down slightly from its peak of 44.5% in 2010. The BLS’ most recent Beyond the Numbers report looks at petroleum import price trends leading up to the 2014 plunge in prices. The analysis is in an attempt to understand the conditions that precipitated the oil price drop and to determine if the drop has bottomed. Follow the link for the full report. The 2014 plunge in import petroleum prices: What happened? 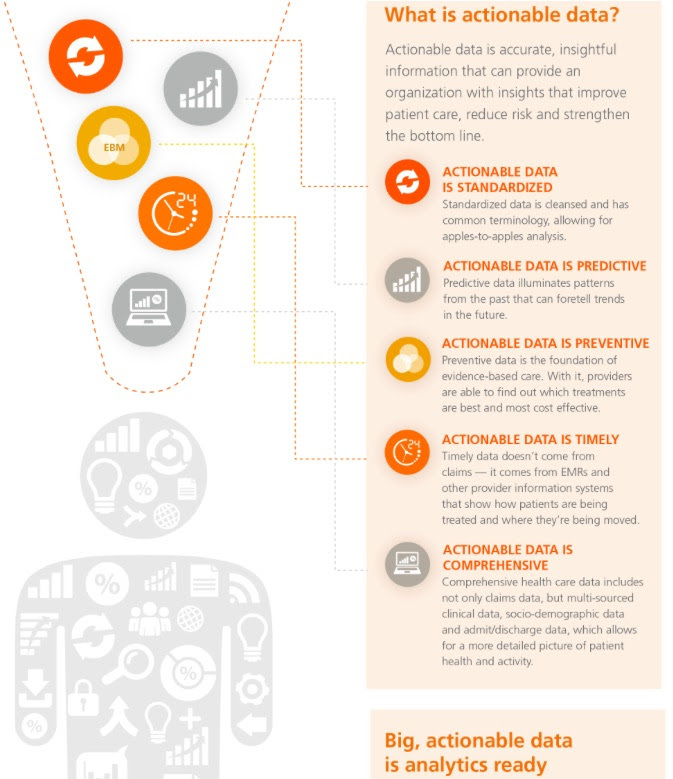 Click the link or the infographic excerpt to see the full image, which explains what big data means in terms of healthcare, from how it’s sourced to how it becomes actionable. At the 2013 Smithsonian Future Is Here conference, Dr. Eric Green – Director of the National Human Genome Research Institute and key player in the Human Genome Project that mapped the first genome – explained in simple detail what the genome is, how it was initially mapped, how it’s mapped today and what he sees as the greatest opportunities for genomic medicine. It’s a worthwhile watch for those curious about the process and significance of unlocking the code to human life. Regeneron Pharmaceuticals Inc., which partnered with Geisinger Health System to sequence partial genomes of 250,000 volunteers, claims to have isolated genes that play a role in high cholesterol and have a drug in the works to target these specific genetic glitches. Wall Street analysts project that once the drug wins approval, it could generate profits of $4.4 billion by 2019. Other companies are looking at the genetic indicators that could explain differences in how medicines are metabolized from patient to patient to understand why a treatment might work for one, but not the other. Read on for how several drug companies are approaching genomic sequencing as this vast health and economic opportunity unfolds. 1. Immune-boosting drugs that have been able to “melt” tumors. 2. “Killer cells” that are taken from the patient, genetically engineered to attack tumors and then replaced to do their job. Watch this brief video of one man’s hopeful experience with this process, referred to as “CAR-T."
3. Liquid biopsies that may make it possible for a blood or urine test to detect very early stage cancer. Fourteen big name cancer centers have partnered with IBM to start using its massive artificial intelligence system, Watson, to do in minutes what it can take doctors days to accomplish: compare a cancer patient’s DNA to a database of cancer genes and scientific papers to recommend a personalized treatment plan. How often will Watson and “tumor boards” agree? And when they disagree, whose treatment recommendation will be superior? There’s still much to sort out about this promising collaboration. In 2010, NPR’s Terry Gross interviewed Siddhartha Mukherjee, author of the Pulitzer Prize winning Emperor of All Maladies: A Biography of Cancer. It’s a lengthy, but fascinating interview, one that serves as a humbling reminder that cancer is a shape-shifting, tricky disease. While Mukherjee sees no likely “cure” for cancer, he has great hope for management of the disease over the span of a long and otherwise healthy life. This short, must-see video explains how 3D printing works – and why it’s bound to change everything about transplants of tissues and organs. 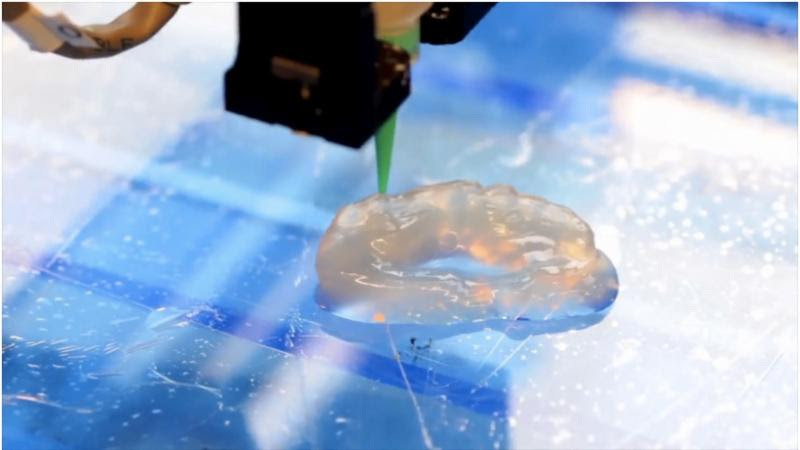 Watch to see how “ink” made from living cells is used to print an ear and a trachea, both of which could someday function as actual human parts. The video also features a patient who had part of his jaw removed, which was then recreated through 3D printing to fit his mouth and allow him to live healthily and normally. Harvard researchers are in the process of tackling one of the medicine’s toughest challenges: treating hard-to-heal wounds, like burns, diabetic ulcers and bed sores. 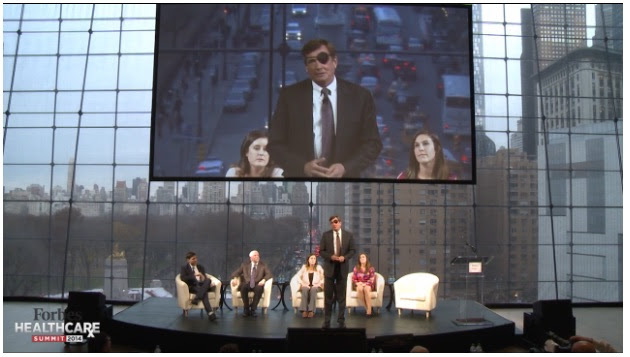 They are developing a smart bandage, complete with data tracking sensors and wireless communicators that can send doctors real-time updates on healing progress, temperature and pH and oxygen levels. Doctors can then digitally take action based on data analysis, like administer antibiotics, adjust oxygen levels or change the temperature at the wound. One of futurist Dr. Meskó’s predictions is that technology will change how we eat, which will transform our health. 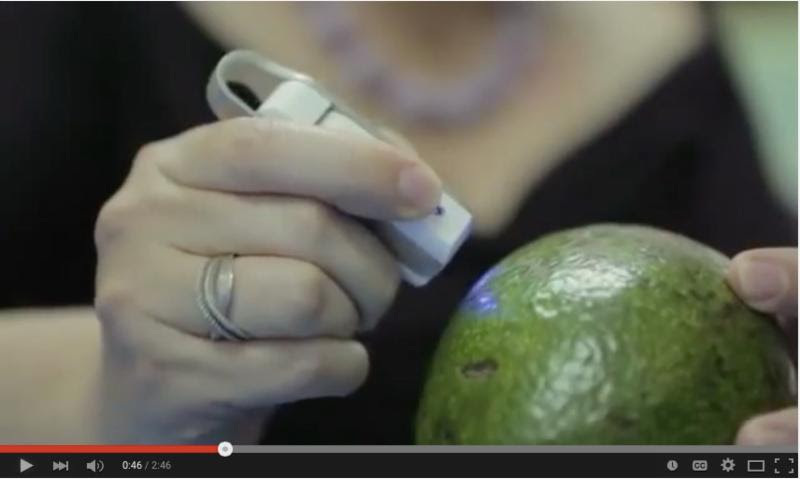 One company is aiming to do just that through their invention called SCiO. This impressive, tiny molecular scanner will tell you the chemical makeup of your food with just one click and then transmit data to your phone. Not only can it determine which watermelon is sweeter or which avocado is ripe, it can also quantify the nutritional information in any food item, even something like a homemade smoothie. Watch the brief video to imagine the possibilities beyond just food. Surgery via ultrasound, with no knives involved, is in early testing phase and showing promise as a potential treatment for brains lesions, uterine fibroids and several kinds of cancerous growths. In his TED talk, medical inventor Yoav Medan tells of a successful brain surgery done exclusively through MRI imaging and focused ultrasound. The patient suffered from essential tremors that inhibited his ability to, among many fundamental things, print legibly. 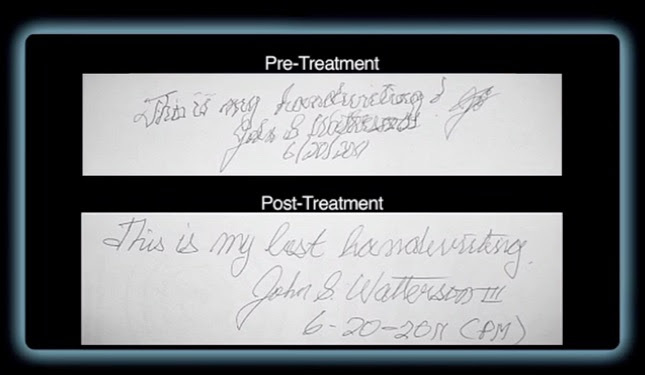 The following image shows the patient’s handwriting before and immediately after the surgery. Watch the video to learn how scalpel-free surgery works. Watch this incredible, short clip to see how “exoskeletons” are helping partially paralyzed people walk again. The “man-machine” interface uses motion sensors to detect a person’s slight upper body movements, which triggers the motorized “joints” to supply walking movements to the hips, knees and ankles. Futurist Dr. Meskó expects that as precision of the exoskeleton’s motor control improves and as recreation of natural sensation is developed, the prosthetic will be able to communicate directly and in real-time with the brain, effectively fusing the man and machine. 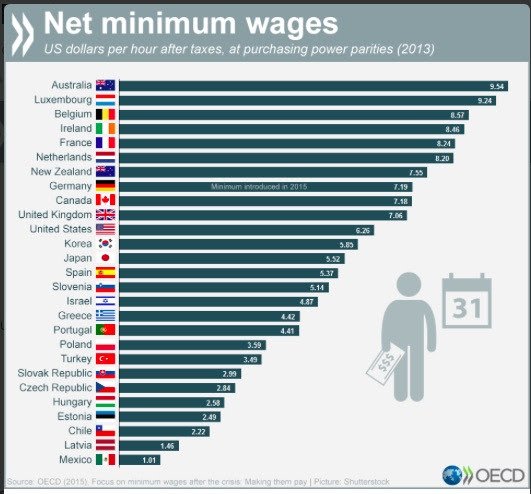 To promote their report on the state of minimum wage in OECD countries (75% of OECD countries use a minimum wage), the OECD recently Tweeted a chart showing net minimum wage in USD of dozens of OECD countries. 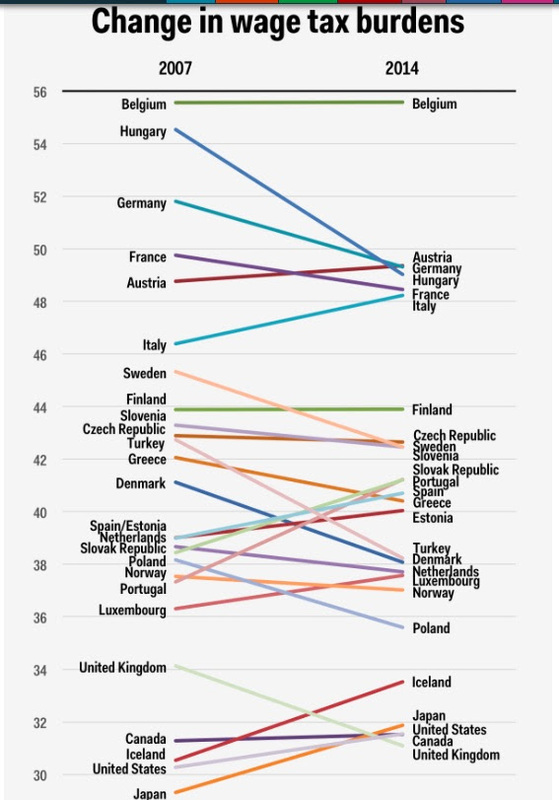 In a separate report, the OECD looked at income tax burdens for various family types in each of the 34 OECD countries. The report made use of a measure called the “tax wedge,” or the total taxes paid by employees and employers, minus family benefits received as a percentage of the total labor costs of the employer. Business Insider then calculated the tax wedge for the full-time single worker in 2007 for the same countries to compare how the tax wedge changed from before the recession to 2014, which is shown as chart excerpt below. 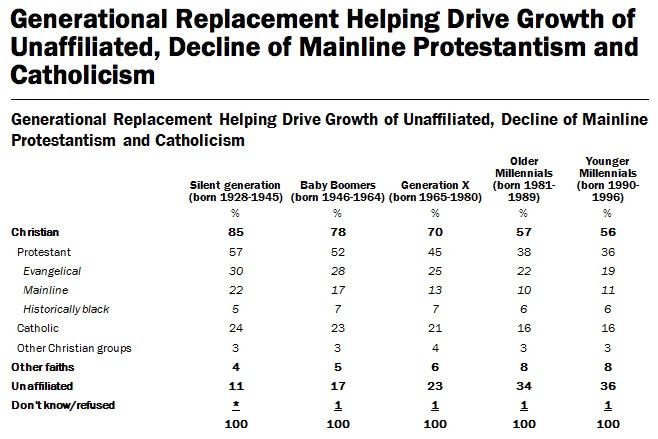 Click the link or the image for the full chart. HBR: Are you a good boss? Or a great one? Most managers hit a certain level of proficiency and then stop working to improve themselves, thus failing to meet their potential. Read this article for steps to take an honest appraisal of your managerial style, determine your strengths and weaknesses and find continual improvement. In a nod to the man who innovated late night television, follow the link for five leadership lessons from David Letterman. 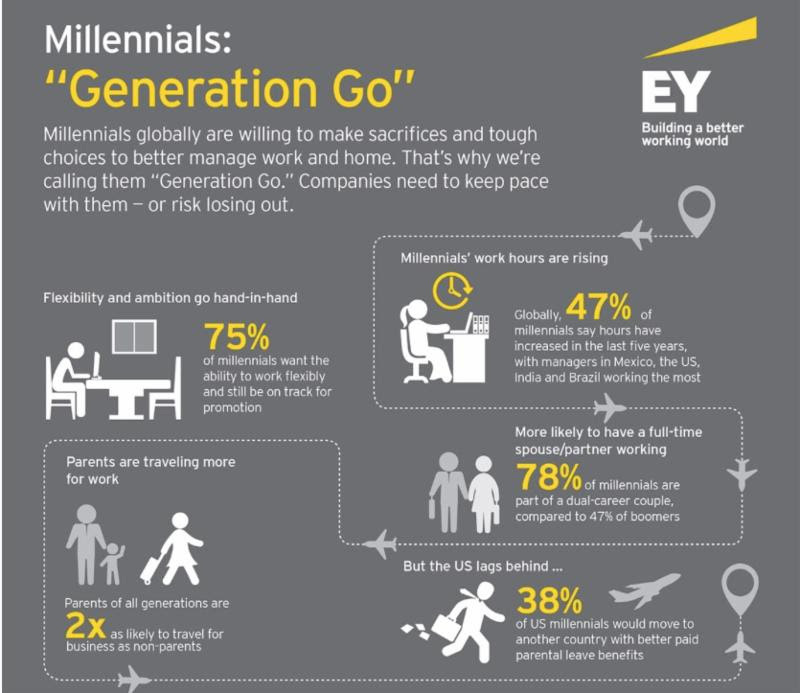 To get a grasp on what employees seek under increasing economic pressure, tax and professional services firm EY conducted a survey of working professionals ages 18 to 67 in the US, UK, India, Japan, China, Germany, Mexico and Brazil. The study found that managing work-life has gotten more challenging for everyone, but parents and millennials have been hit hardest. A shocking 38% of American millennials said they’d leave the US for better parental leave benefits. Click the image below for the full infographic highlighting findings about millennials in the workplace.